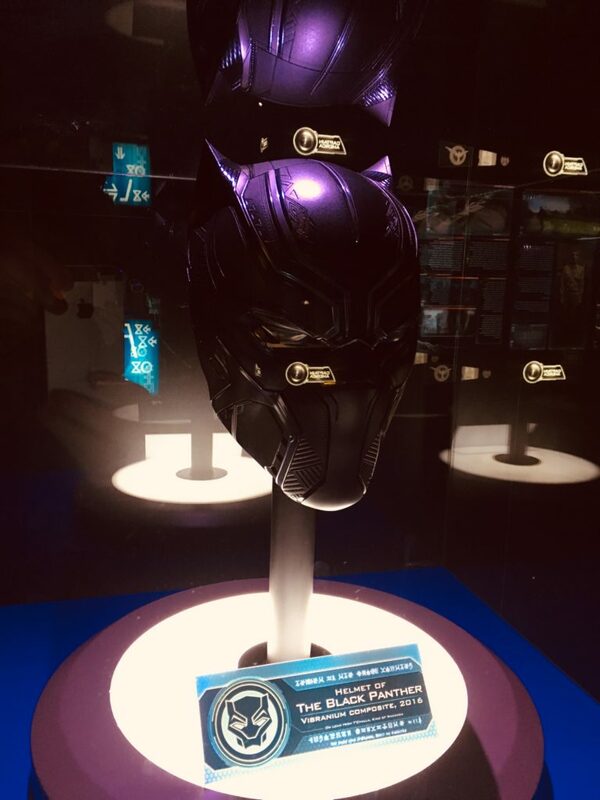 Yesterday I took a trip up to London to visit the ExCel centre, as the supercool and fab Marvel’s Avengers S.T.A.T.I.O.N. is making the London stop of its hugely popular world tour. 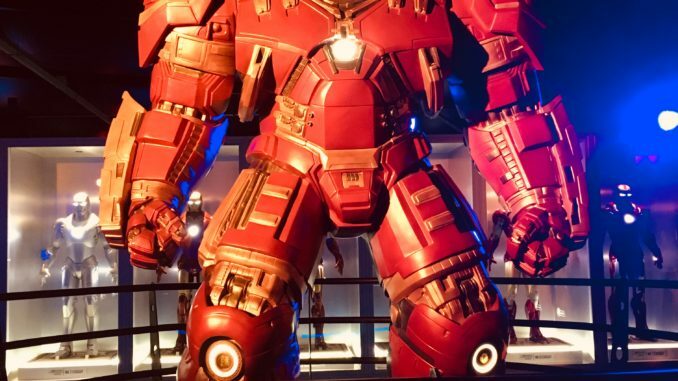 But what exactly is Marvel’s Avengers S.T.A.T.I.O.N. and what can you expect if you visit? 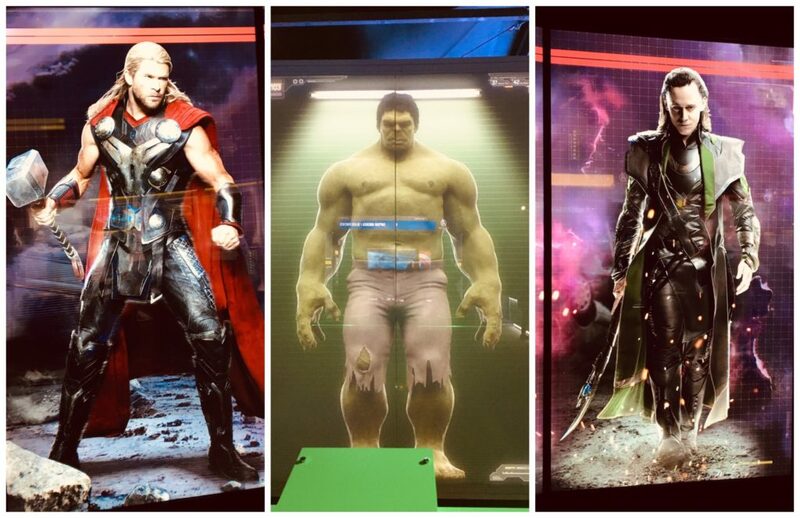 Essentially, this is an interactive exhibit devoted to all things Avengers. Also, it’s a room where it’s OK to say HULK SMASH quite a lot and no one will tell you to shush. Visitors (or ‘recruits’ as they’re referred to by the exhibition staff) get to train to be an agent of the S.T.A.T.I.O.N. You’ll also learn a lot about the back story of each of the Avengers. So if you’ve ever fancied trying to lift Thor’s hammer (I couldn’t. 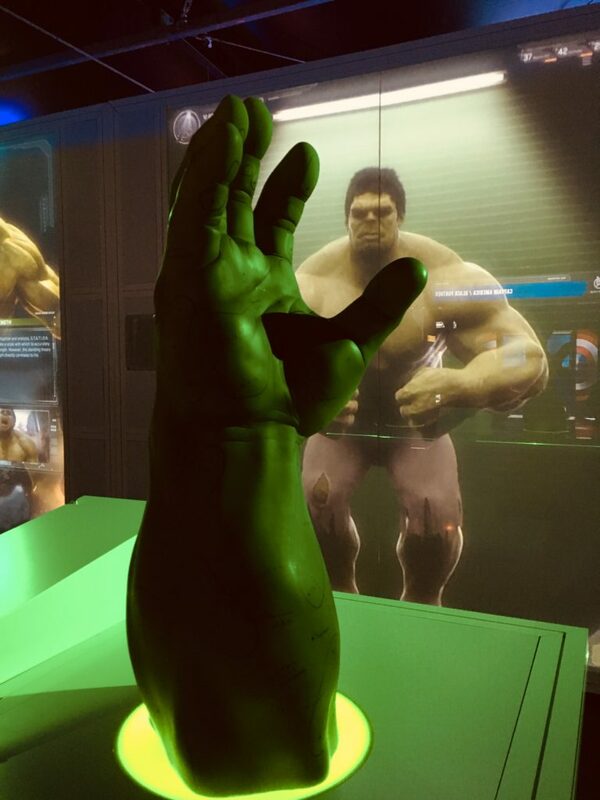 Must do more weightlifting) or taking a sneaky peak at Bruce Banner’s Lab, then this is for you. S.T.A.T.I.O.N. is an acronym for Science Training and Tactical Intelligence Operative Network, and there’s lots of learning to be done about the science of the Avengers’ world. The educational elements are kept pretty light. If you have a child who’s interested in STEM subjects then this would be a great day out for them. The Thor Observatory – dedicated to Thor Odinson. Attempt to lift Thor’s hammer, Mjölnir, view Thor’s outfits and study the universe and its current parameters using NASA’s EYE on the exoplanets program. 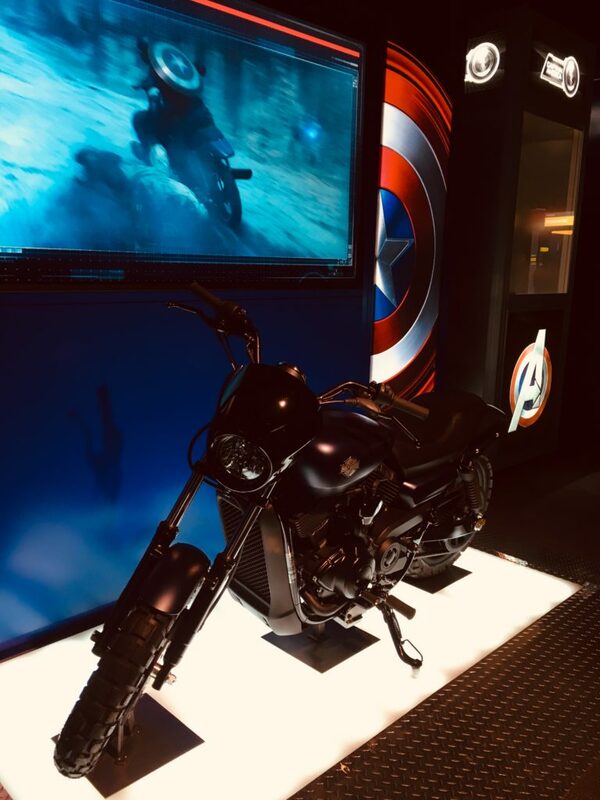 Check out Captain America’s Harley Davidson and personnel file, while exploring the science that turned Steve Rogers into Captain America. 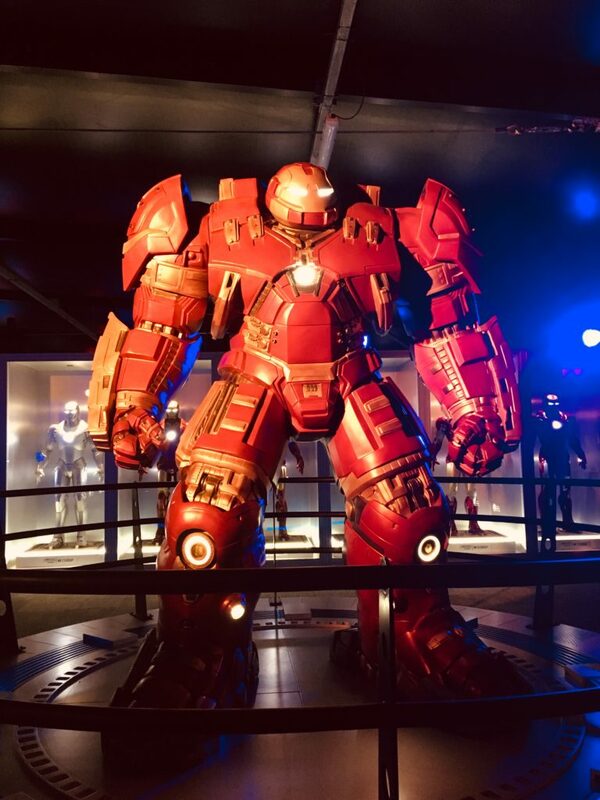 Iron Man Engineering Bay – trainee agents can get up close and personal with Iron Man’s iconic suits of armour. Then, experience what simulated flight inside the suit would be like. As a fan of the Avengers’ films, I thought it was really fun. If you’re going, aim for as quiet a time as you can. Either than or be prepared to queue for the interactive elements. Marvel’s Avengers S.T.A.T.I.O.N. is suitable for all ages, but it is dark and lit by the lights from the exhibits. If you or your child has trouble with flashing lights and too much stimulation then it may not be for you. Marvel’s Avengers S.T.A.T.I.O.N. is open at ExCeL London from now until March 2019. You’ll find the Marvel’s Avengers S.T.A.T.I.O.N. in a purpose built building next to ExCel London. Nearest Tube is Prince Regent. The event is all on one level and is suitable for wheelchairs. There isn’t anywhere to sit down within the exhibition, and there are no loos or refreshments (though there are plenty nearby at ExCel), so bear this in mind. Under 4s go free, 15’s and under must be accompanied by someone aged 18+. For visitors with disabilities, one free carers’ pass per ticket is available. Adult tickets are £27.50 , child tickets are £17.50 and family tickets are £70 (all plus booking fee). Tickets are available here. Tickets are timed to ensure the attraction doesn’t get too busy. Many time slots this side of Christmas are already booked up, so be flexible about your dates and book in ASAP. It’s a self-guided tour, with length of visit estimated at around an hour. It took me 40 minutes to go round with no kids and no crowds, so an hour minimum seems about right.